Yesterday I spent a freezing cold afternoon watching Bitton AFC play Welton Rovers in the Western League. It was proper amateur stuff and, with no exaggeration, made Bath City look like Barcelona. There can’t have been more than 100 fans in the ground, while the whole of Bitton town appeared to be in the clubhouse. It was my first visit to The Recreation Ground (in no way to be confused with Bath Rec). My first impression of the pitch was amazement of the slope. If it snowned, you could go sledging – it was that steep. The game was poor and I am unsure whether this was just a bad match or just the norm for Western League. Welton scored the only goal of the game, midway through the second half. There wasn’t even a corner until late in the game. The Welton keeper was unable to take goal kicks (literally), and had to get an outfield player to do the honours. He was almost as useless with his hands and nearly humiliated himself by struggling to catch a simple ball from his own teammate. Still, Bitton failed to even test the goalie over the whole 90 minutes, which annoyed the locals; particularly one elderly fan who summed up the keeper as "he can’t catch and he can’t even kick". An interesting day, but I won’t be rushing back anytime soon. 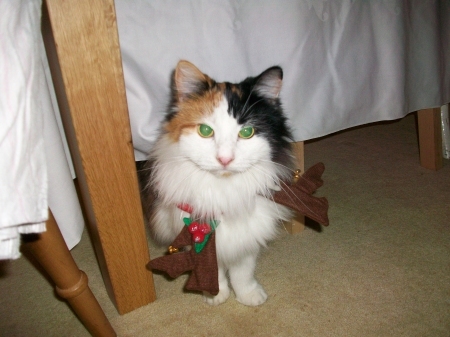 I won’t bore everyone too much with my Crimbo stories, so don’t worry. My sister, inspired by Nigella Lawson, decided she wanted to take charge of the Christmas dinner this year. Her being a newbie to the kitchen, and me not being a fan of turkey, I was very surprised and impressed with the results. It was certainly better than the food at the work Christmas party. Unfortunately, I will be unable to return the favour next year. I am no Gordon Ramsey. I’m not even a Jamie Oliver. I am a RUBBISH cook, and until Bird’s Eye start making microwave Christmas meals, I am staying out of the kitchen. The afternoon was spent on the Wii and terrorising the Issy the cat. 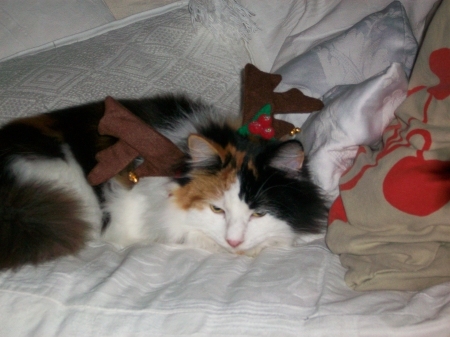 Somebody bought her a pair of novelty antlers. It was very difficult getting her to keep still so we could attach the gift to her head, but after the threat of using staples was issued, she agreed to wear them and no person or animal was hurt. I think she was so full of turkey and tired, that she just agreed in order to get some peace and quiet. As usual, Christmas telly was rubbish. I was forced to endure EastEnders. What a horrible programme. The Royle Family was brilliant and the only decent thing on TV. Boxing Day, I went to Twerton Park to receive my pressie from Bath City – a 2-0 win over Dorchester. It was bitterly cold. I nearly got frostbite on my toes and fingers and even contemplated calling mountain rescue to save me from the Arctic conditions. Never mind, I’m off to Bitton today to watch another game of non-league football – and yes, it is just as cold outside! all i want for christmas is blackpool’s manager, simon grayson in charge of leeds. here is a story i found about him. i don’t want adie boothroyd. i don’t want gus poyet. if you get mr grayson, i will be a very, very happy little boy. i know blackpool don’t want mr grayson to go, but i want him and will be very, very sad and almost certainly throw a major tantrum if we don’t get him. if you buy mr grayson for leeds, he can get us into the premiership, win us the champions league and that world cup thing manchester united won yesterday. i would also like a new stadium, cristiano ronaldo, lionel messi and fernando torres, but i know they may not all fit on your sleigh. He’s only lost the last 5 games after a good start to the season. As an ex-Leeds player, I think he deserves a little more respect if I’m honest. 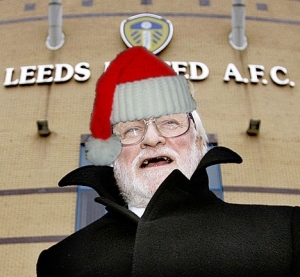 Well, if Ken Bates is your boss, what do you expect? Something had to be changed though. I’ll judge whether it’s a good decision when I find out who the new manager is and how he does. 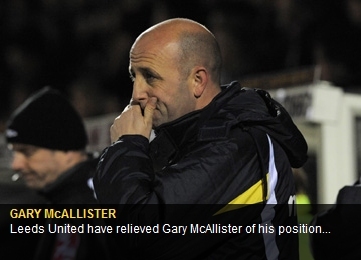 Ideally Billy Davies or Ian Holloway will get the job, but I hear Gus Poyet already has his name on Gary’s desk. I think the players need to take more responsibility. 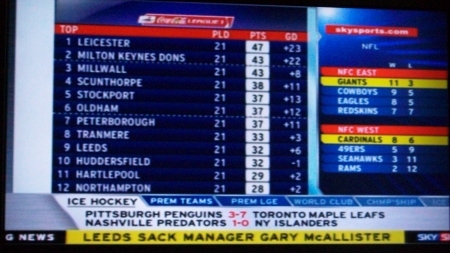 No doubt, when Leeds get a new manager, they will go on and win a handful of games. It’s the same with Harry Redknapp at Spurs and Sam Allardyce at Blackburn. No one man can make such a change in a short space of time. These over-paid pre-madonnas need to look at themselves. They won’t. Nothing will change and things will get worse before they get better. For the first Saturday in a few months, I didn’t go to football. 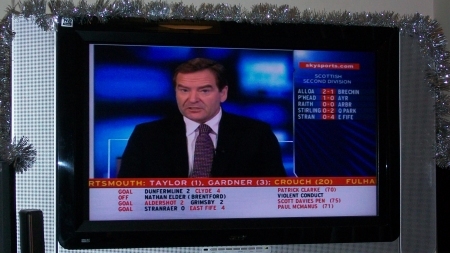 Instead I spent the afternoon in my flat with Jeff Stelling. The man’s a legend, and on days like these, where the weather is cold and your team is being beat in a London ghetto, it’s not a surprise why there are so many armchair fans.